From Sunday 21 June – Saturday 27 June is NZ’s National Volunteer Week! Since there are many volunteer activities first-year undergrads can get involved in with the Co-curricular Record, we thought it would help you decide which to join with some spotlights on what’s available! First up is the UC Gym Host activity. 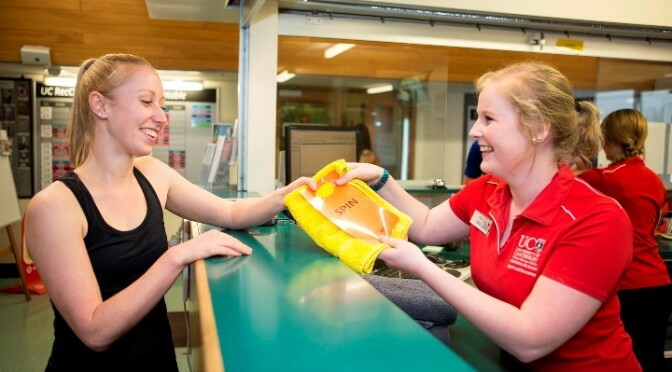 UC Gym Hosts work within the RecCentre, helping with management and promoting fitness programmes. They have the task of carrying out safety checks, assisting reception and giving members an enthusiastic and supportive atmosphere. Joining this activity gives you the opportunity to share your love of fitness with the UC community and get experience working in a gym offering a whole range of different classes. By now, most first-year undergrads will have heard of the Co-curricular Record, with quite a few of you signing up and joining activities already. For those that aren’t in on the action yet, here’s a quick run-down of what the Co-curricular Record is. 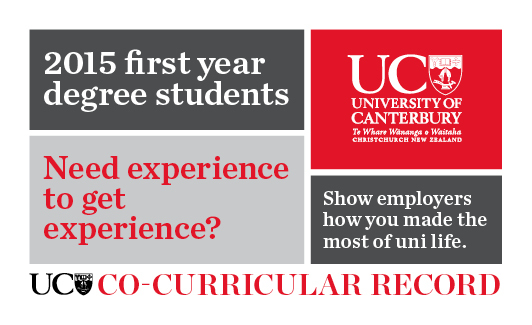 The Co-curricular Record (otherwise known as CCR) is a brand new initiative at UC and a New Zealand first. It’s a similar idea to your Academic Transcript, only this is a record of non-academic volunteer and paid roles you can engage in through UC and the UCSA. This means that activities like volunteering with the Student Volunteer Army, supporting events as a UC Host, being a Class Rep and a whole lot of others get noted on your CCR so you can show off exactly what you’ve been involved in. Your Record will be officially verified by UC so it can be a great document for job or scholarship applications, or even just to have all of your memories of uni life in one handy place. While the CCR is only available to first-year students this year, all going well next year we’ll be opening registrations to students at all levels. There’s already a heap of activities waiting behind the scenes – UC Mentors, Student Leaders, UCSA Club Exec roles, etc. So for first-year undergrads, keep an eye out next semester for new activities to be added, some student testimonials and more! Find out more and register on the CCR website. 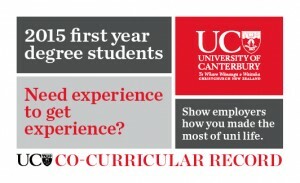 The UC Co-curricular Record has launched! If you’re a first year undergrad degree student, there’s an exciting initiative that you can join called the Co-curricular Record (CCR). Then you can join activities (like the Student Volunteer Army, or being a UC Mentor) and have them logged on your Record, including the experiences and skills you picked up. Your CCR is a great way to demonstrate how you got out there and helped out your fellow students as a part of UC, and can even serve as an added bonus for when you go job hunting! Even better, UC’s CCR is the first of its kind in New Zealand, putting you a step above other university graduates!